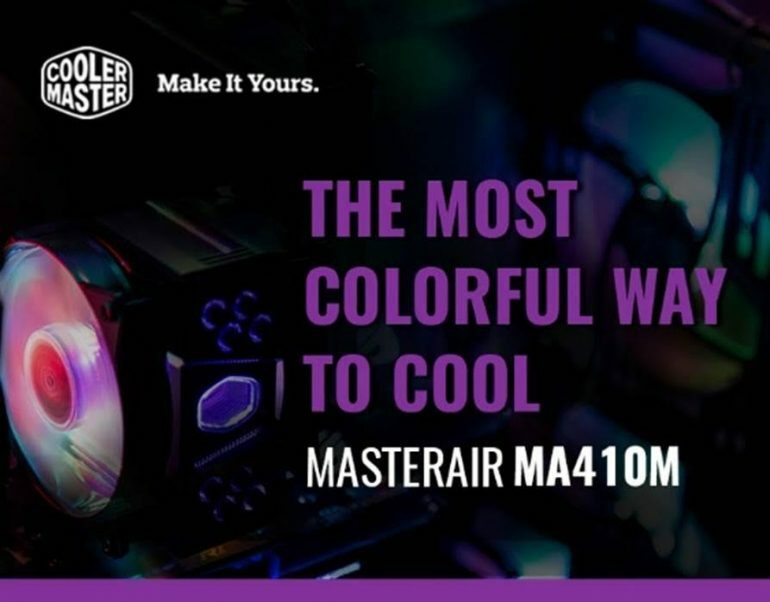 SINGAPORE – Cooler Master, a leader in the design and manufacturing computer components and peripherals, launches a new addition to their flagship four heatpipe coolers, the MasterAir MA410M. Equipped with dual 120mm MasterFans, it continues the tradition of excellent cooling performance and reliability from the Hyper series. The heatsink is precisely designed, ensuring the spacing between each fin of the tower is at the optimal distance to guarantee minimal airflow resistance and thus allowing maximum air into the heatsink. Equipped with Continuous Direct Contact Technology 2.0 (CDC 2.0), which means all the four heatpipes were compressed to increase CPU contact surface area significant increases thermal conductivity and heat transfer. With the patented X-vents and Air-Guided Armor combined with CDC 2.0 to provide the best thermal solution for your build. The MasterAir MA410M the first of its kind, equipped with twin translucent MF120 that allows excellent visibility to the array of colors displayed through individually controlled LEDs. Not only is it armed with addressable RGB function, but it is also sync-able with the standard RGB motherboards. Even without an RGB motherboard, users can customize the RGB lighting through Cooler Master’s Master+ software. Cooler Master includes a free Addressable RGB Small Controller in the box. This controller requires no software. Users can adjust the mode, color, and brightness with just the touch of a button. Cooler Master believes that giving PC users the freedom to create visually stunning RGB effects as well as, provide efficient cooling for their systems is vital to achieving one of the company’s missions. With innovative technologies coupled with a vast array of lighting effects, the MasterAir MA410M is one of the best possible mixes of performance and aesthetics in the segment. The release of MasterAir MA410M will commence immediately, priced at SGD 89. How do I change the brightness?